The River Walk in San Antonio Texas is one of the most romantic places to stroll. With mariachi bands serenading the couples walking hand-in-hand along the water’s edge, the cool summer breeze, the dimly lit walkways, the benches to sit and rest, and the stone bridges to cross. 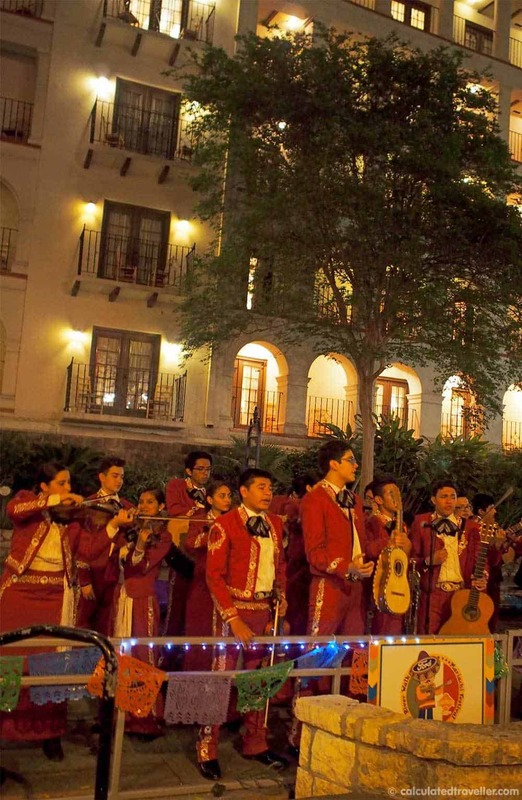 What’s even more romantic than strolling along the River Walk is sleeping in one of the many hotels along this famous promenade, the ultimate in romantic stays along the river being a stay at the historic Omni La Mansion del Rio Hotel. Omni La Mansion del Rio first opened its doors in 1968 for the San Antonio World Fair, but before being a luxury hotel the site was the location of St. Mary’s College from 1852 – 1966. 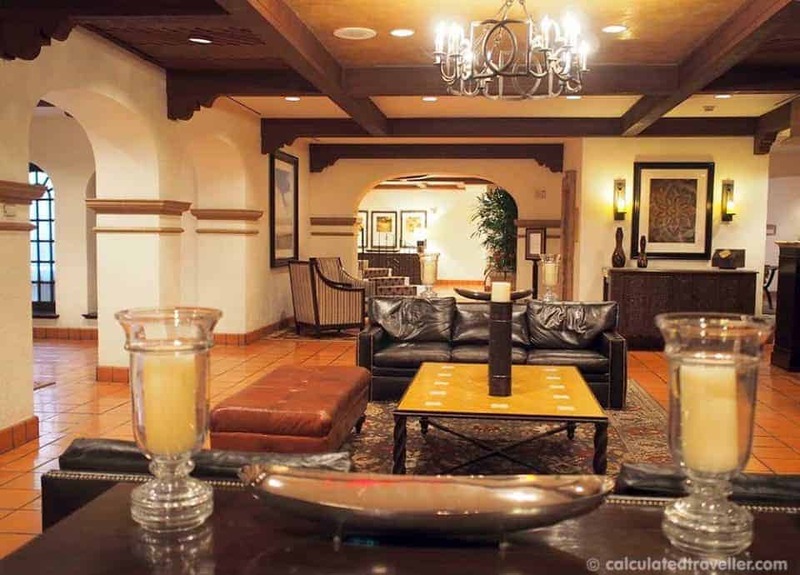 A Texas historic landmark, the hotel is built and decorated in the Spanish Colonial Mexico style with white stucco walls, Spanish terra cotta tiles, dark wooden trim, curved arches and columns, and secluded courtyards. It’s as if you are staying in a Spanish hacienda in Mexico. The hotel is a bit of a maze at first, but with a map in hand and after a few missteps, it’s easily navigable. 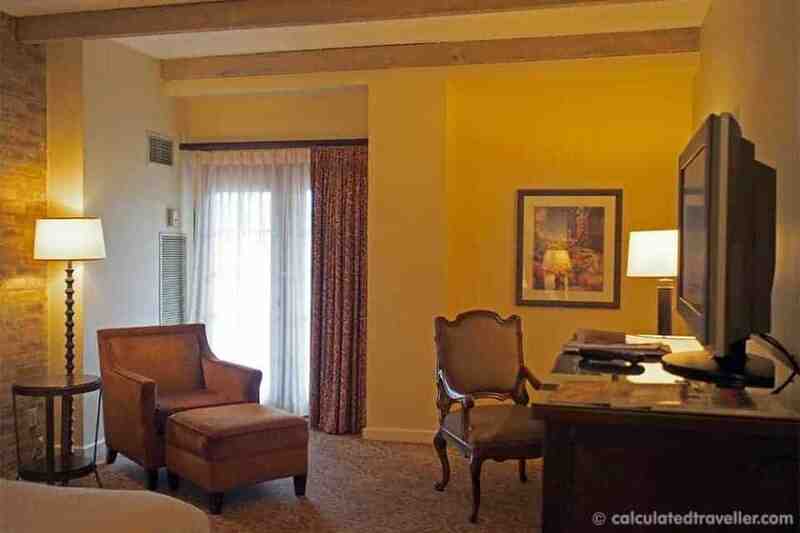 Our room was stunning — spacious and romantic. 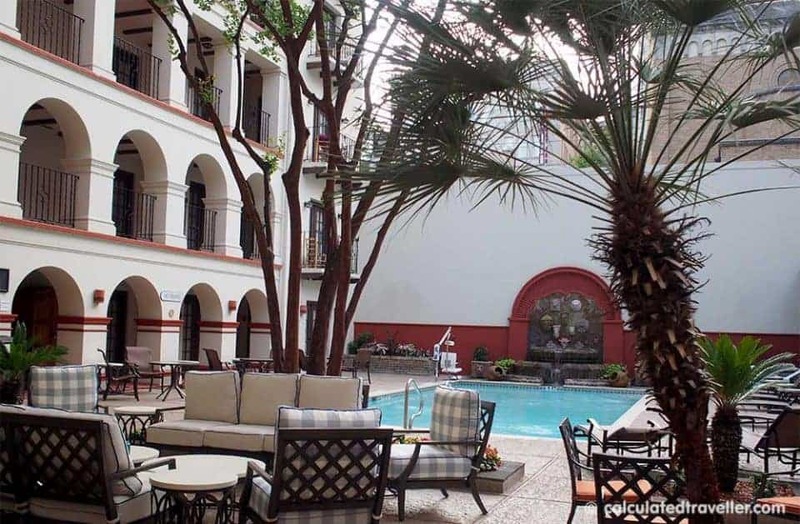 Truly one of a kind and in keeping with the allure of what staying in a historical hotel along the River Walk in San Antonio should be. Expansive in size and comfortable with a king size bed, luxurious bedding, antique wood furniture, desk, and cosy reading chair. Through dark stained French doors, our shared balcony overlooks the river, West Crockett and Navarro Street below.The location is ideal, providing easy access to all the main tourist attractions via foot, water taxi, or car. 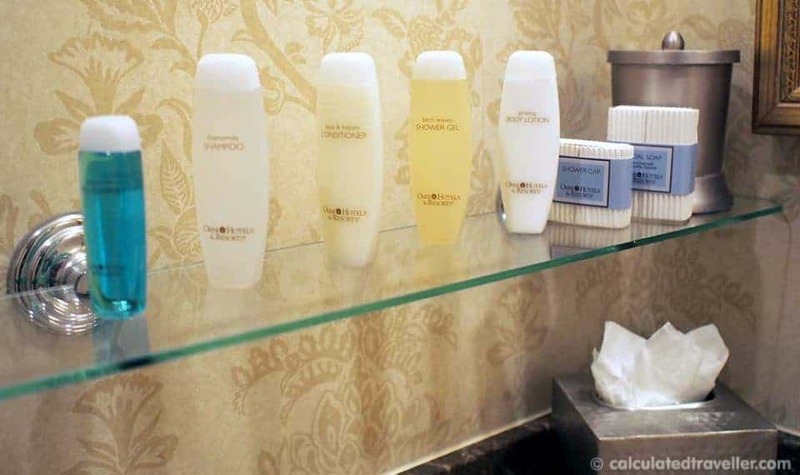 We thoroughly enjoyed our stay especially the little complimentary perks that included comfy bathrobes in our room, upscale toiletries, turndown service, Wi-Fi, bottled water and deluxe coffee vouchers for use in the lobby café per person per day. I have to say that the staff throughout the hotel was incredible. From check-in to check-out, everyone was just a joy to deal with, but I do have to give a special shout out to the exceptional concierge and coffee shop staff for providing excellent service. 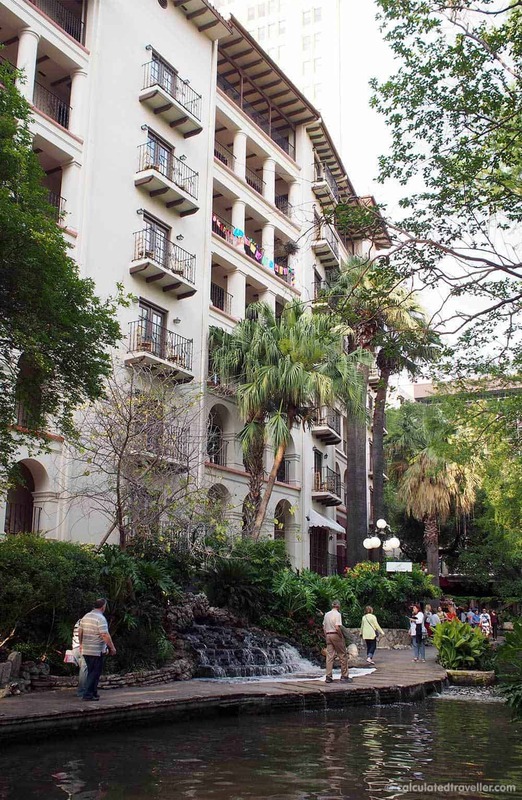 Spending three days at the Omni La Mansion del Rio Hotel along San Antonio’s River Walk is the ultimate of romantic escapes that I’ll remember for many years to come. Read more reviews of the Omni La Mansíon del Rio Hotel on Trip Advisor. 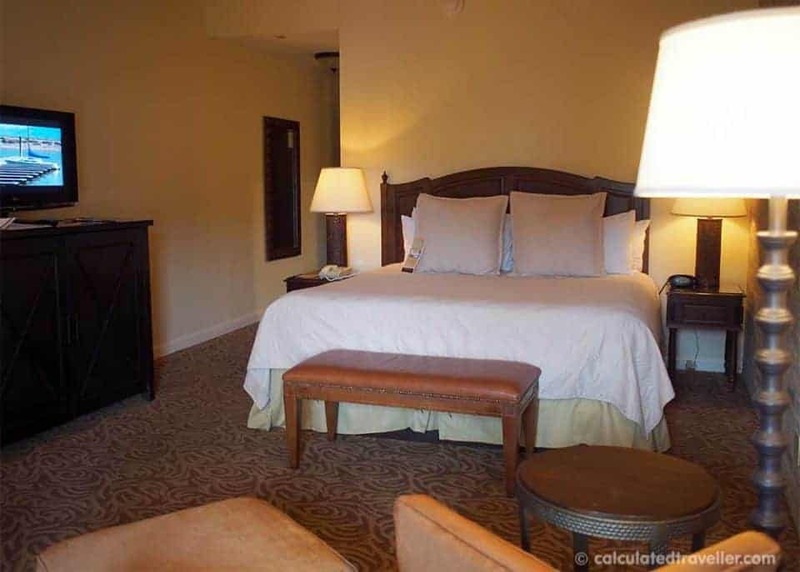 Have you stayed in a historic hotel before? We’d love to hear about it! Travel Assistance provided by Visit San Antonio. All opinions are entirely my own. I remember as a child my mom taking my brother and I on the boat ride along the San Antonio river and how much I enjoyed listening about the history! It doesn’t matter what time of the year it is, the river is always full of life, great food, and beautiful scenery. I always hear great things about my home city of San Antonio!